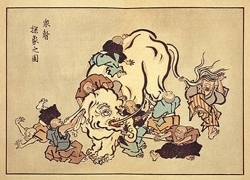 One of my favorite Buddhist parables is the “Blind Men And The Elephant“. Several blind men each touch a different part of an elephant and proceed to describe and debate what they think an ‘elephant’ is. The moral here is that we can only perceive a sliver of the whole. With only 5 or 6 senses at best, we are all blind in the final analysis. D.C. Lau’s translation of Chapter 71 sums it up well, ‘He who thinks does not know’. What? Thinking is the way I know anything, right? Not exactly. Thinking is the means through which you think you know something. Like the blind men who all thought they knew; our awareness tricks us. The problem creeps in when we extrapolate a piece of the ‘whole picture’, and with unwavering certainty think we know the whole. Interestingly, I see fear of the unknown as the trigger for that emotional certainty. In short, our fear of the unknown creates a need to know, which leads us to hang on for dear life to anything that we think we know (i.e., we believe our beliefs). Awareness is the light that underpins thought. It is like a spotlight; it shines here or there, but it can’t shine everywhere simultaneously. The big picture is beyond awareness’s reach. Like the blind men and the elephant, awareness only sees a small part of the whole at a time, making awareness’s thought always narrow, biased, and essentially false. Thus the saying: knower not speak; speaker not know. I would take that a step further, ‘knower not think; thinker not know’. Ironically, our awareness can only be the ‘knower’ by knowing Nothing, as chapter 10 alludes. Equally ironic, Nothing is what we fear the most. Nothing correlates to death, silence, emptiness, loss, the darkest night, entropy and decay. Unless one is truly omniscient, realizing I don’t know is superior, not knowing this realization is a defect. So, what does that say about my ramblings here? Well, at least I’m mostly speaking to the value of nothing, and the difficulty we get ourselves into by not knowing that. As it happens, awareness of my blindness often gives me the humility to avoid being blindsided by my blindness. I suppose this knowing arises from some deeper ‘thought free’ region of awareness. This gut-knowing is closely connected to experience, and I just keep thinking, writing and speaking about it to bolster my awareness of it. Some would say that I’m brain washing myself. Sure, I am foolish of human mind also. Unending, it cannot be named, and returns again to nothing. All under heaven say my way is great resembling nothing.